Taekwondo is a Korean martial art and the national sport of South Korea. It is the world's most popular martial art in terms of number of practitioners. Gyeorugi, or sparring, is an official Olympic sporting event. 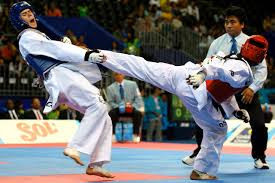 In Korean, tae means "foot"; kwon means "fist"; and do means "way" or "martial art"; so Taekwondo is loosely translated as "the way of the foot and fist"
The International Olympic Committee recognized the WTF and taekwondo sparring in 1980. The senior section is typically made up of nine ranks. These ranks are called dan, also referred to as "black belts" or "degrees" (as in "third dan" or "third-degree black belt"). Black belts begin at first degree and advance to second, third, and so on. Taekwondo is known for its emphasis on kicking techniques, which distinguishes it from martial arts such as karate or southern styles of kung fu. The rationale is that the leg is longest and strongest weapon a martial artist has, and kicks thus have the greatest potential to execute powerful strikes without successful retaliation. One defining kick Taekwondo is the back kick or the side kick. Taekwondo as a sport and exercise is popular with people of both genders and of many ages. Physically, Taekwondo develops strength, speed, balance, flexibility, and stamina. An example of the union of mental and physical discipline is the breaking of boards, which requires both physical mastery of the technique and the concentration to focus one's strength.